January 28, 2012 - Frontier Airlines names key executive positions, David Siegel will join the Company as CEO, President, and interim Chief Operating Officer. In assuming these positions, Siegel will remain on the Republic Airways Board of Directors while stepping down as lead independent director. Siegel’s appointment is another step towards the goal of making Frontier Airlines a viable, strong and independent business. Siegel and the entire Frontier executive team will be based at Frontier’s headquarters in Denver, Colo.
Siegel comes to Frontier with a wealth of relevant CEO experience. Siegel previously served as CEO of XOJET, gategroup, US Airways and Avis Budget, in addition to other key leadership roles in the airline industry. "Dave is an incredible talent with the skills to lead Frontier during its separation process from Republic and continue its transformation into a profitable ultra-low-cost-carrier," said Bryan Bedford, Chairman, President and CEO of Republic Airways Holdings, Inc.
"We believe that Dave’s combination of travel industry and restructuring experience makes him uniquely well suited for the task at hand. Placing Frontier in Dave’s capable care affords me the opportunity to fully focus my time and energy on the regional airline segment of our business." Frontier also announced the addition of new senior officers for Frontier’s finance and commercial team, among other changes in the executive leadership team. Robert Ashcroft has joined Frontier as Senior Vice President, Finance. Ashcroft will work closely with Siegel and Bedford in the project of moving Frontier towards independence, as well as defining opportunities to ensure profitable growth for the Company. Ashcroft has an unusually diverse background encompassing finance, planning and IT. Most recently he was at Allegiant Travel Company overseeing network and capacity planning, scheduling, pricing and investor relations. Daniel Shurz has been promoted to the role of Senior Vice President, Commercial for Frontier and will have responsibility for all commercial activities, including network planning, pricing and revenue management, marketing, product and brand definition. Daniel joined Frontier as Vice President of Strategy and Planning in 2009. Greg Aretakis is assuming an expanded role as Vice President of Network and Revenue Management, adding responsibility for scheduling and planning, sales and distribution to his current portfolio. Greg previously served as the Company’s Vice President of Revenue Production. Dan Krause has been promoted to Vice President of Marketing and Customer Experience for Frontier. Dan has been with Frontier since 2004 and most recently served as Senior Director, Commercial Strategy and Customer Experience. Frontier Airlines is a wholly owned subsidiary of Republic Airways Holdings, Inc. an airline holding company that also owns Chautauqua Airlines, Republic Airlines and Shuttle America. Currently in its 18th year of operations, Frontier employs 5,000 aviation professionals and operates from hubs at Denver International Airport, Milwaukee’s General Mitchell International Airport and Kansas City International Airport. 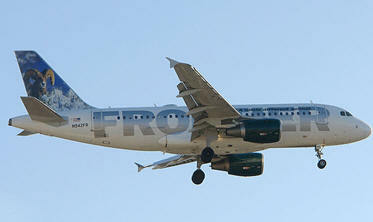 Frontier offers service to more than 75 destinations in the United States, Mexico and Costa Rica.